Hello New Schoolers and Old Skoolers Alike! As you know, I am always on the cutting edge of super cool technology and of course that includes gaming. However there comes a time when there are simple solutions to old problems and the Gaems G155 solves an existing issue. But first let’s see what exactly the G155 is. What is the Gaems G155 Mobile Entertainment Center? It’s very simple. 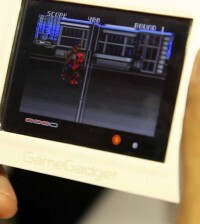 It’s basically a sturdy space age polymer (plastic) that has a built in HD Mobile Monitor for gaming on the go. The so called Gaems G155 Mobile Gaming Environment features a 720p 15.5″ Mobile Monitor that works only off of an HDMI input (Sorry Component Cable Owners – Time to Buy A Cheap Cable and Upgrade). Believe me. this will make your life easier and it’s a nice compact solution. It also comes of course with a with the ability to jack in 2 Sets of Headphones. As this is a nice feature especially if you don’t want to blast those little speakers (though they work fairly well!). And of course there are the additional game accessory spaces on the side of the unit for controllers, wires, and maybe a bag of chips! So want to see this bad boy in action? This is a full hands un-boxing and review of the unit. Honestly for the price, the unit is good. The protection may not help a super high drop from total destruction but have an on the go gaming environment for less than $300 when most decent HD monitors are $250+ is certainly not bad given what you get. Alright gamers, well I’m throwing this on the ol’ Gaems G155 on the Xmas list. Bottom line is you should too! I’m a sweet, friendly, honest and caring girl in search of casual encounters. I’ve divorced for over two year, so I got a profile(Angle78) on –Casualloving dot c’0m–. It’s a first and safe place for people who wanna to start a short-term relationship. Maybe you wanna hit me up, seriously! ++++++no bounds or limits in front of true love.